Here at Wise Bread, we know that couch-sharing services, such as Couch Surfing, can save you money when traveling. We have also heard that hosting travelers through these services is a great way to meet new people, get in the spirit of travel, and even make some money. As good as this sounds, many have reservations about hosting strangers in their home. After all, house guests can be frustrating, expensive, and even dangerous. But it doesn't have to be this way. 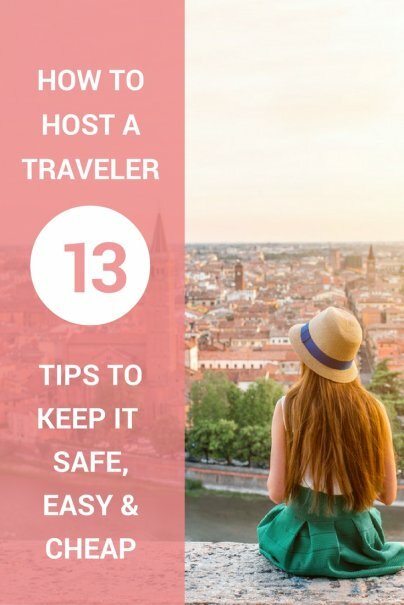 Here are some tips to help make hosting travelers safer, easier, and even cheaper. Start slow: You are not required to hand over the key to your home and welcome a wandering stranger with open arms. If the idea makes you uneasy, start slow and only accept invitations for coffee, dinner, or a short tour of your town. Once you have met several friendly people, you may decide that having them spend a night at your place is not such a big deal. If so, arrange to meet at a neutral location, like a cafe or the library, first. If you don't like the looks of things, politely decline your invitation. Don't be a stranger: If socializing with a stranger makes you cringe, then do everything you can to make sure the person is not a complete stranger when you meet in person. Begin by creating a complete and detailed profile on the couch-sharing network of your choice. List your interests and favorite activities, and include something about your habits. If you get up early for work and like to turn-in with the sun, state this explicitly in your profile. If you don't like guests using your computer, say so up front. Get more information: When requests come in, check the traveler's profile. If it raises questions, don't be afraid to ask for clarification. Ask questions and get to know the person electronically before you meet in person. Most sites also offer the ability to gather information from references and the traveler's previous hosts. Set boundaries: Again, you are not required to hand over the keys to your home. If you don't want to leave a stranger there alone, explain that the house will only be open when you are there, and that your guest must find a way to occupy his or herself while you are out during the day. Be clear about times you will and will not be there and offer your cellphone number for emergencies. Don't do it alone: Involving a friend can make you feel a lot more comfortable. When you go to meet your guest at a neutral location, bring a friend along for support. At the very least, let someone nearby know that you will be hosting a guest and that you may contact them in the event you begin to feel uncomfortable. Don't be afraid to say no: If you do not feel right about the person or the process at any point, from the initial request to the second day of the visit, do not be afraid to say no. Orient your guest: When your guest first arrives, take the time to give a tour of your home. This is a good way to show the person where everything is, but it is also a subtle way of explaining anything that might be off limits. Rather than handing your guest a list of rules, mention your restrictions as you pass by. "This is my bedroom, you won't need to go in there..."
Provide some basic supplies: Some people leave things like guest-sized shampoo, toothpaste, and other basic necessities in plain view, keeping their personal items stowed away, while sharing their bathroom with a guest. More important, is showing your guest where to find some basic cleaning supplies, like a broom, mop, sponge, and so on, in case they accidentally make a mess. Give them space: Most travelers participating in home-sharing programs look forward to getting to know their hosts, so expressing in interest in spending time with your guest shouldn't be a problem. Giving them space for their things, especially if you live in an apartment, might be. Still, it is important to clear a space for their luggage and even offer a basket or some shelf space to use. This helps prevent a backpack full of dirty clothes from being emptied across your living room floor. Encourage activity outside the house: Be ready to suggest things to do in your town. Having a map ready and a list of your favorite places to eat and hangout shows your guest that they should be out exploring, not in your house, sitting around. Ask for a hand: Finally, don't be afraid to ask for some help around the house. Most guests are very appreciative of the effort hosts go to house them and will be happy to lend a hand. Both Wise Bread and The Simple Dollar have great tips for saving money when guests are visiting. Still, hosting travelers is unique and there some special tips that can help save you money. Buy toiletries in bulk: Specifically, toilet paper. It's the one item you can count on guests using. If you like to offer smaller items like shampoo, consider buying a large bottle at the bulk store and filling a smaller bottle before guests arrive. Ask your guest to cook dinner: Most guests will be happy to make something from their home country. Offer your services as a "prep chef" to ensure they can find the things they need in your kitchen. Hosting a traveler is often a wonderful and enlightening experience. It allows you to learn about a new part of your country or the world and even make a new friend. Let us know how it works out in the comments. I have been a member of Servas my entire life. Regional organizers screen potential members across the entire globe, so it always felt safe. It allowed my family to travel through Europe and Asia, without paying for a single night in a hotel. We just hopped from family to family to family. A far richer cultural experience for families, at a far cheaper price. Plus, we always had traveling international families coming through and staying at our house. Which was one of the most incredible learning experiences I have ever had. I have been a member of Couchsurfing (couchsurfing.com) for 7 years and have NEVER had a bad experience!!! There are a few things to keep systems like these safe, such as only staying with or hosting members who have only positive references from others AND who are verified, as well as being a good host/surfer yourself to keep the positive community going! Couchsurfing is particularly good about instilling safety measures for those who use it. It's an incredible way to see the world, not for someone who is cheap and wants to stay at a free place, but for TRAVELERS who want to get to know a country through the people who actually live there! Because of Couchsurfing, I have been invited to a Greek wedding, got free juggling lessons from a local university instructor in Ireland, stayed with a Japanese Beatles fan in Japan, and have had NUMEROUS beers, dinners, and amazing conversations with people I would have NEVER met had I stayed in hotels! By the way, for those of you not ready to open your homes or stay in the homes of others, Couchsurfing also gives you the options of meeting travelers (or locals) for coffee, or giving a short tour of your city. It's all about breaking down the wall of perpetual FEAR that is constantly instilled by our wonderful media! I agree with both of you that it's the personal connections services like CouchSurfing and Servas foster that makes them incredible. Not every meet up will be a perfect match, of course, but this is just a fact of life. If we didn't have children, we would probably try this. But I just don't invite strangers to share a roof with my little girls. Not even strangers with great references. What a good idea. Having done a lot of hitch hiking in my wayward youth, I remember very clearly the generosity of many who gave me a lift and offered a room and meal for the night. Will definitely give this some serious thought.